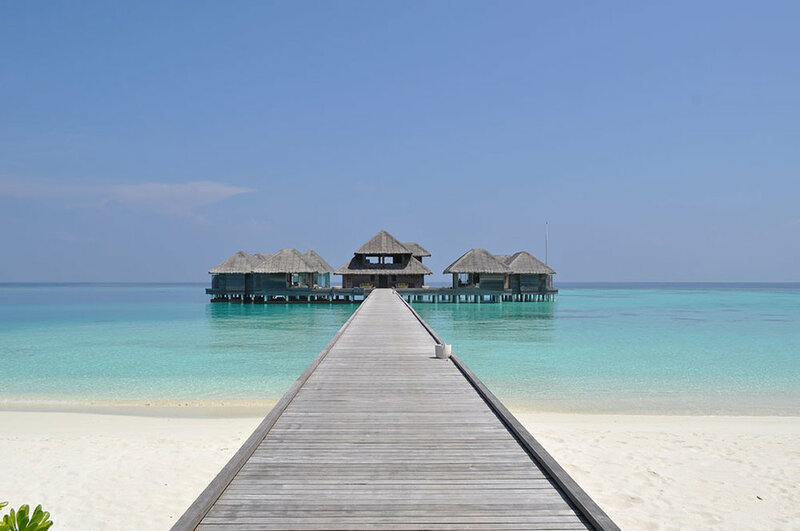 Huvafen Fushi is all that you want from a paradise island and then some. Located just 35 minutes by speedboat from Male you can be checked in before those awaiting seaplanes have even departed. A warm welcome awaits you as you board their private boat. A cold towel and a refreshing drink of coconut water and mint, and the flight here is soon forgotten. You speed across the water, slowing only when crossing the wakes left by other boats, you wonder what awaits you. There are few places where you arrive and instantly feel your heart beat slow, Huvafen Fushi is one of them and this is paradise at its best. So quiet and serene the island looks like it has been Photo Shopped, sending images home will no doubt invite questions as to how much they have been "touched up". Truth is, you could use the cheapest disposable camera on the planet and still not take a bad shot. My little slice of this island paradise is a Deluxe Beach Bungalow, number 14 to be precise, although I have my eye on the jaw dropping Ocean Pavilion for my next visit. Number 14 is located on the sunset side with the exclusive Beach Pavilion only a couple of doors down, so I am clearly in the right neighbourhood. 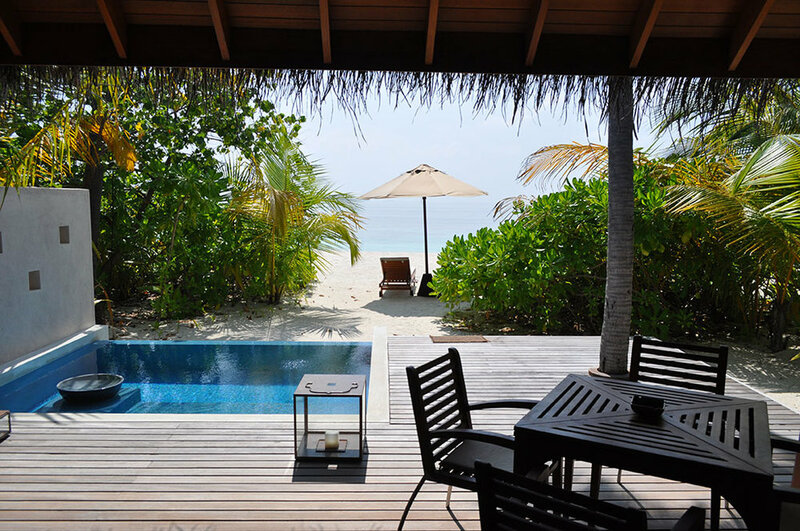 Having said that, Huvafen Fushi with only 44 keys and each villa enjoying a private pool means that peace and privacy is a given, even when fully occupied. A sandy path leads through lush greenery to my door, entering the room my eyes are immediately drawn from the room to the view that will greet me each morning - a partially covered deck with a huge basket chair made for two, a private plunge pool and beyond that the beach of powder-white sifted sand. This part of the island is also the best place to snorkel. The room design is simple, clean lines, light wood and white bed linen, why try to compete with nature? The bed itself is huge, the surround sound system plays specially compiled chill-out music by DJ Ravin, I am already in heaven and then I discover the bathroom…. 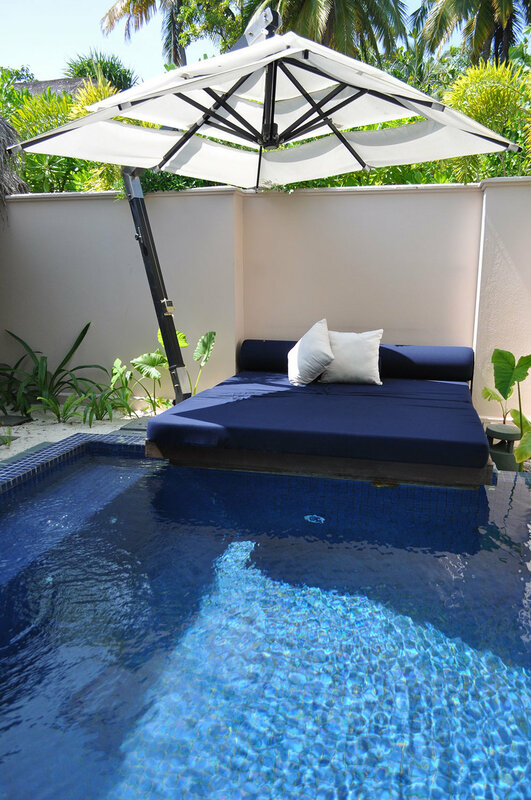 Now I am faced with a dilemma, do I enjoy the plunge pool, shaded day bed and outdoor shower in my garden bathroom to the sound of the Huvafen CD, or do I enjoy the pool on the front deck or even swim in the crystal clear ocean? With so much watery luxury to enjoy can I really justify a trip to the spa later? A tour of the island leads to discoveries such as the strategically placed day beds and hammocks dotted in the tropical greenery; spots for private dining; and air conditioned escapes from the sun. Water sports range from house reef snorkelling trips, both day and night; Dhoni excursions; diving and fishing; and for the less amphibious there is Sting Ray feeding on the beach not forgetting the Lime Spa and its underwater treatment rooms where you can enjoy the marine life of Huvafen Fushi without getting so much as your feet wet - unless of course you opt for a pedicure! Dining options vary from the casual Fogliani for a lunchtime pizza, Celsius, where guests can enjoy a buffet breakfast and dinner, for those not taken by the dinner buffet options, or with special dietary requirements, there is an a la carte option or the chef might create a little surprise for you. Sunday evenings there is the poolside Lobster and Champagne barbecue. Salt is an open kitchen dining experience serving fresh seafood and next door is the delectable Raw with a menu you that might just inspire you to try it at home. 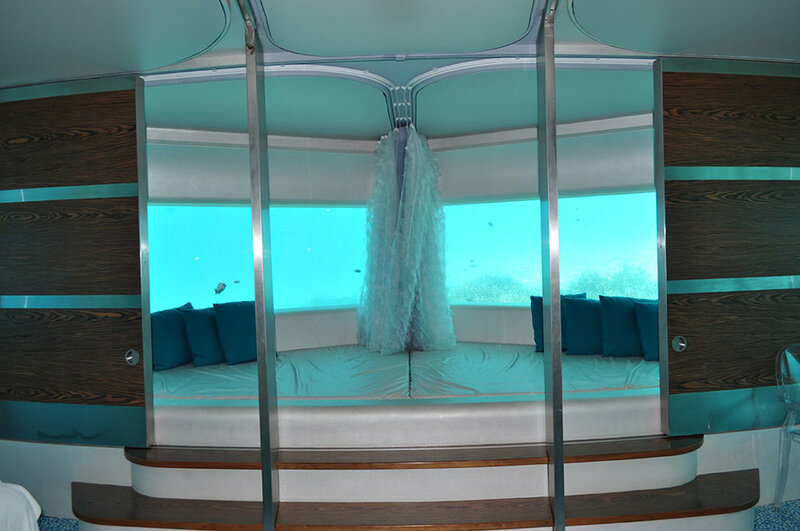 Vinum is the house wine cellar and is in fact the largest in the Indian Ocean, another great spot for a private dinner?